Recently I became interested in lockets as a potential symbol in a story. Curious about their history, I did a little research. They really are an interesting and emotional reflection of the heart’s capacity for syrupy love. 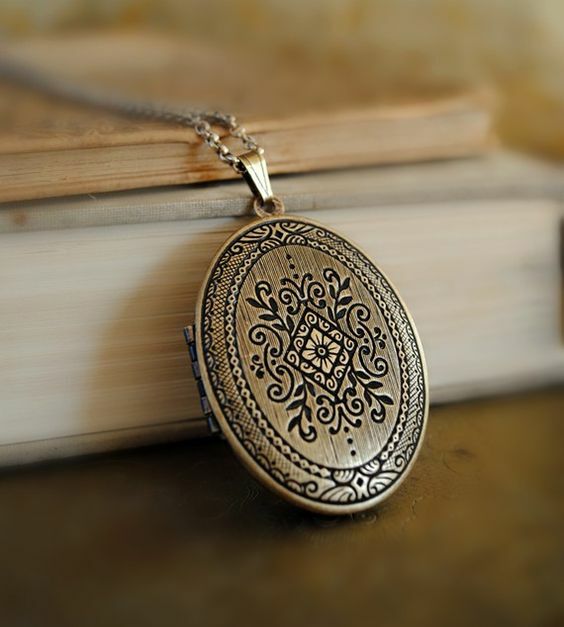 Scholars pretty much agree that lockets were originally born out of the medieval transition from amulets to a more rational and less “magical” mindset. Still, items of great value, sentimentality, and power were kept in the lockets. Everything from notes, to hair, to poison. Queen Elizabeth wore a locket with a painting of her mother in it—the famous Ann Boleyn, beheaded by Henry the VIII. I can imagine the picture and her mother’s untimely demise kept the Virgin Queen on her toes and careful with men! Lockets, however, truly entered the mainstream of fashion with the Victorian age. Prince Albert gave Queen Victoria a bracelet with eight pendants on it, each containing a lock of hair from all their children. The queen was rarely ever without the sweet gift. When Albert died, she was devastated. She had a locket made with the Prince’s photo inside. Hearts melted by the sentimentality of her gesture, fashion aficionados of the day turned the mourning locket—and then lockets in general—into the fashion trend of the day. Black bog oak (an old wood) was the material of choice. Just as there was a cultural expectation that a widow would wear black for a year, she was also expected not to wear any jewelry other than the mourning locket for the same amount of time. I was more impressed with the spinner lockets, though—a particular style that became popular during the Victorian era. According to the ebay buyer’s guide, “These lockets have a bail, which is a D-shaped or oval component used to connect the locket to the necklace chain. The bail is not fixed to the locket itself, leaving it free to spin.” I don’t know why that impresses me. Possibly because I’ve never seen one and they tend to be more valuable than a normal locket. If you find a spinner locket, snap it up! It was fun learning about them!